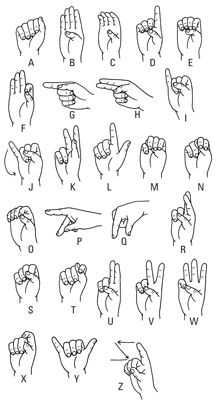 Successfully communicating with others in American Sign Language (ASL) starts with learning to sign the manual alphabet, numbers 1 through 10, important expressions, and important one-word questions. And because good communication also involves manners, learning some basic do’s and don’ts of Deaf etiquette is also helpful. Signing one-word questions in American Sign Language (ASL) is a way to initiate small talk, get to know people, and gather information. When you sign these one-word questions, look inquisitive; the facial expression will come naturally when you are genuinely interested. Also, tilt your head and lean forward a little as you sign the question. 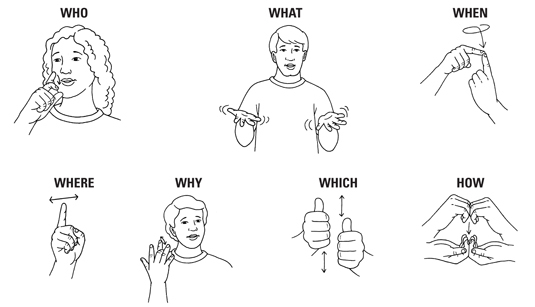 Practice signing these basic expressions in American Sign Language (ASL) to meet and greet people, join in on conversations, answer questions, and be polite and courteous. Note: If you need to fingerspell a word that has two letters that are the same, make a small bounce between the letters or simply slide the repeated letter over slightly. In American Sign Language (ASL), knowing how to sign the cardinal (counting) numbers helps you in everyday situations like banking and making appointments. Pay attention to the way your palm faces when you sign numbers. For 1 through 5, your palm should face yourself. For 6 though 9, your palm should face out toward the person who’s reading the sign. As you become more confident in your ability to communicate through American Sign Language (ASL) and begin to meet Deaf acquaintances and form friendships, keep some simple etiquette do’s and don’ts in mind. To get a Deaf person’s attention, tap him or her on the shoulder or flick the light switch. Let a Deaf person know that you can hear and that you’re learning Sign. If you’re at a Deaf social function, allow the Deaf friend you came with to introduce you to others. Introduce yourself using your first and last name. Converse about sports, the weather, politics, pop culture, or whatever else you’d discuss with your hearing friends. Don’t barge into a Deaf person’s house because you think they can’t hear the doorbell. 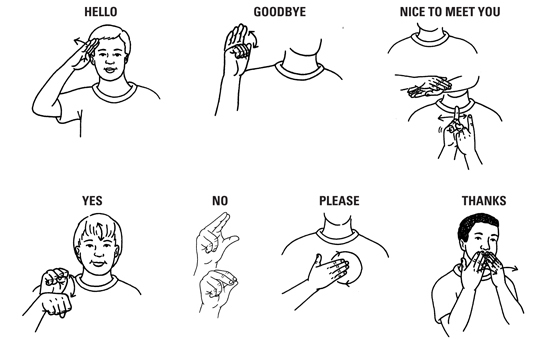 Avoid ordering for a Deaf person in a restaurant, unless he or she asks you to do so. Never try to correct a Deaf person’s signing or lecture them that they don’t sign the way your instructor does. Don’t initiate a conversation about a Deaf person’s hearing loss. Asking such questions implies that you think of the person as broken or inferior.